Some of the popular restaurants in Branson offer many varieties of delicious cuisine and Jayne Dough is a unique restaurant where you can indulge with the delicious clubs, subs and sandwiches. Beautifully located at 1232 Branson Hills Parkway, Jayne Dough is owned by Tom and Sharon who worked previously in aviation for over 40 years. Now that they owned Jayne Dough, they enjoy meeting all of their new customers as well as catching with their local customers every time they come in. Tom’s duty in the restaurant is attending each customer’s sub choice while Sharon is seeing to it that they use the right topping. Just don’t ask them the secret on how they do it. For days when you’re not feeling like choosing a sub sandwich, try a salad where they have several choices including a tasty Roasted Chicken salad, Club salad with Turkey and Ham or a Garden salad. The duo strives to make their menu a fresh choice of dining experience for every guest in a friendly atmosphere where you can feel at home. The sandwiches at Jayne Dough restaurant are always made fresh and use tasty ingredients, but it’s really all about their bread that is made fresh in the store all day long including sandwich rolls that are always soft and delicious. 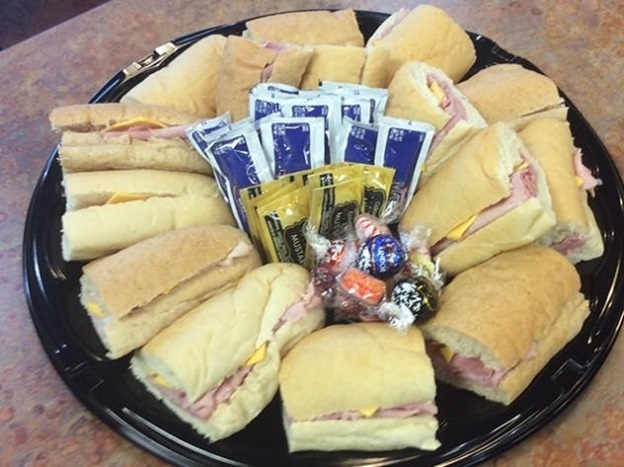 This sandwich restaurant serves traditional sub sandwich with turkey, roast beef, and Italian meats, as well as their secret recipe of chicken and tuna salads. They also serve flavorful hot soups and flatbread pizza. If you want your sandwich hot, they’ll even toast it for you. The smell of fresh baked bread at Jayne Dough is incomparable. So this sandwich restaurant has quickly become one of Branson’s favorite lunch and dinner stops. All of the sandwiches of the restaurant have one thing in common – fresh bread all day, all evening, and every day. Wondering how do they have fresh bread all day long? They won’t tell you as it’s the secret of Jayne Dough. The menu of the restaurant offers traditional subs, turkey, ham, roast beef and roasted chicken, along with Italian Classic and Italian Supreme. The sandwiches at Jayne Dough also have premium selections. These include freshly sliced Pastrami, Tom’s Extreme Italian Supreme, Tony’s made in house Meatball Sub, and their new Nathan’s 4 to 1 All Beef Hot “Dawg” which is served only on Friday combined with “Tom’s tomato-less chili”. They also have salad sandwiches that include Jayne Dough’s Famous Chicken Salad and Jayne Dough’s Delicious Tuna Salad. Their salads are all made in house and they are offered in half size (6 – 7 in), or a whole size (12 – 13 in). These salads are served on your choice of Wheat bread or French White. Jayne Dough Sandwiches also offer quarter size sub for the kids and a flatbread cheese pizza for them as well. If you are on the hunt for a quick, fresh, delicious sandwich in Branson, visit Jayne Dough where you can indulge with the delicious clubs, subs and sandwiches.